Leelah's suicide and the conversation her note inspired has rocked families in the Ohio region, becoming part of a national conversation. Here, we share the facts and report what happened. 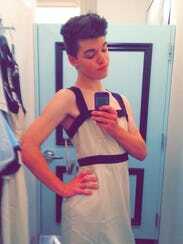 In life, Leelah Alcorn felt alone. Born male, she feared she would never be the woman she felt like inside. In death, the transgender 17-year-old -- born Josh Alcorn -- wanted to make sure others never felt that way she did. "The only way I will rest in peace is if one day transgender people aren't treated the way I was, they're treated like humans, with valid feelings and human rights," Alcorn wrote in a post on Tumblr. Her parents, she wrote, wanted her to be a "perfect little straight Christian boy." Her final public words: "Fix society. Please." On Sunday, just before 2:30 a.m., Alcorn was struck and killed by a tractor-trailer on I-71 in Ohio, about four miles from her home in Kings Mills. No charges have been filed, and the State Highway Patrol continues to investigate. Her body was sent to the Montgomery County Coroner for an autopsy, which will take several weeks. "She was super bubbly and upbeat with a really brash sense of humor; she could make anyone laugh," said Abigail Jones, 17, one of Alcorn's co-workers and friends. They were caricature artists at Kinds Island, an Ohio amusement park. Jones even drew Alcorn as Elsa from Frozen, "her favorite thing ever." The duo was close -- going to see movies, getting ice cream and texting. In July, Alcorn told Jones that she was transgender. Alcorn's family declined to comment to The Enquirer. In a statement via the Kings Local School District, they requested privacy. According to the statement, Alcorn was most recently enrolled as an 11th grader at the Ohio Virtual Academy, an online school. One way or another, her death is another hell the preachers make their money sermonizing on. Another tremendous sad shame is around here in Cincinnati and increasingly in other locations, LBGTQ groups provide outreach education to youth. In my area of the world there is GLSEN in Cincinnati and the Dayton LGBTQ center has reached out to several transgender women and men (including me) to establish an outreach. I'm not saying you should use me as an example but even if you have to wait a long time-it does get better.